Over Thanksgiving break I looked at my plan book for the remainder of the calendar year. I was done with my reading and writing units and needed to consider what came next. With reading I knew I wanted to do a Mock Newbery and Caldecott unit right before Christmas break, but I planned on teaching that one the week before break. What unit could I fit in the next three weeks AND keep my students attention during this crazy time of year? The answer was simple, a unit on graphic novels. 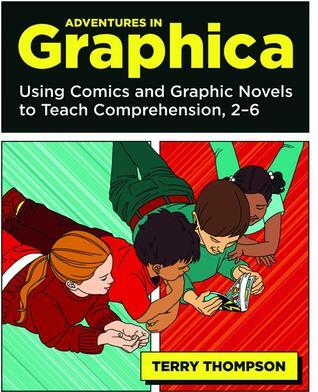 I’ve never taught a graphic novel unit before but after reading Terry Thompson’s amazing book, Adventures in Graphica, I knew I wanted to try one this year. If you are considering this type of unit, I highly recommend this book. It does a wonderful job of not only explaining the brilliance in Graphica, but also the many reading strategies you can us these books to teach. Last week I mapped out an eight-day unit in reading and writing. Due to an insane schedule, we don’t have writing every day, so this will take me all the way to break in writing and leave enough time for a two-week Caldecott/ Newbery unit in reading. Perfect! When mapping out the unit I looked over Terry’s book, added some lessons from there, some things I wanted to go over with the students, and left some room for ideas that might arise as I teach this for the first time. Then the kids poured over their books. They shared with friends the conventions they found. We discussed new ones found and other interesting things we came upon. Great discussions ensued in each class about our reading preferences and why we like or don’t enjoy reading graphic novels. It was amazing. In writing class (I only teach writing to my homeroom) we continued the discussion but also talked about what things we need to keep in mind if we are creating a comic strip. We created an anchor chart, listed the type of topics we’d like to create a comic for, and sketched some thumbnails out. In each class I taught today, three reading and one writing, there were groans when I announced it was time to stop. I wandered around during the time they were exploring the graphic novels. Kids were spread around the room and I was floored by the insightful discussion the kids were having. I can’t wait to continue this unit and see what the children and I learn from each other and this wonderful format of writing. I promised my students as we were leaving school on Tuesday that I would read a book a day. 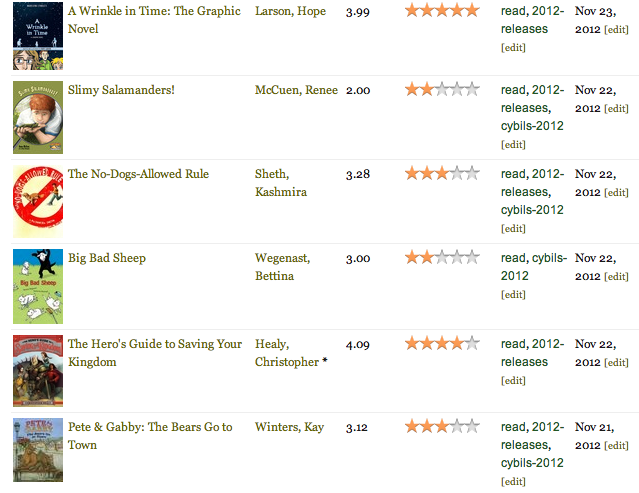 Now I did put in the caveat that I could read picture books or graphic novels as well. It turned out I read a ton regardless. Still not emptying the “to read” shelves – but when boxes are shipped back from NCTE full of books, that makes it all the more difficult. I’m reading Penny Kittle’s amazing book for teachers, Book Love. What can I say, buy it. Penny teaches high school but it doesn’t matter. Her words, her message, are for all of us. I’m also halfway through Bomb by Sheinkin. This is a dense non-fiction book about the making of the atomic bomb. I say dense because you aren’t going to pick it up and breeze through it. That being said, I love this book. The history major in me is eating it up, albeit making me take my time. This won’t be a book for every kid in my class – it’s a bit difficult. But I always have those kids obsessed with any and every thing about wars, weapons, etc. They will love this. I remember reading a quote once that writers live their lives with their eyes wide open. Before I was a teacher that writes, I don’t think I truly understood that idea. But tonight, as I lay with Liam just as I do each and every night, this popped in my mind. I immediately scribbled it down. Must share with my students in the morning. Do you write? Do you share your writing with your students? I know it can be scary but it is the single best thing I've done for my writing workshop. When you were small people told me I’d made a mistake. We should put you in your crib. But others whispered secrets to me. How they’d give anything for these moments back. Reminders to listen to you. But it did for us. The move to your own. Each night Daddy can find me here. Neither one of us wants to stop. Reading, typing, while you drift off. I wouldn’t change this for the world. How you curl your body up next to mine. The rhythmic tap, tap, tap of your hand on my side. Your contented sigh, Mama, as you drift off. One year ago today, November 22nd, this blog was born. I left NCTE in Chicago knowing I had to start writing. I had the far off goal of wanting to publish some writing, but the short-term goal of wanting to write because I knew it would make me a better writing teacher. · The knowledge of how scary it is to share your writing. · The realization that criticism hurts, even when given for good reasons. · On the reverse side, I know how much compliments and comments mean to a writer. Just the fact that you notice what they’ve done is huge. · I’ve been part of blog tours for new books. 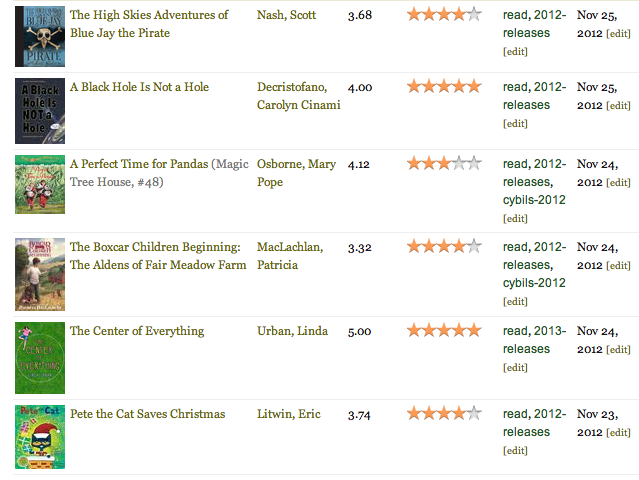 · Met great authors of children’s books. · Connected with many wonderful authors of professional books as well. · And I’ve learned a lot – about writing but also about teaching. Diving into the world of blogging myself has started friendships with authors of other blogs. I read their posts and learn each day. Honestly, when I wrote that first post one year ago I assumed this blog would mainly be for me. And I think that was a smart stance, I needed to be ok if no one ever read it or commented. My thought was it would be an online journal for myself – reflection on the classroom, inspiration, and my love of books and teaching all written down in one spot. But so many of you have stopped by, commented, and subscribed. I can’t thank you enough for all of your encouragement. It isn’t much but I have a $15 gift card to Barnes and Noble to give away today. I would much prefer to give you a gift card to an independent bookstore, but wanted anyone across the country to be able to use it. Fill out the form below if you’d like to be entered and thanks for being part of this amazing first year, I am absolutely grateful today for all of you. And of this blog, I am certain; the best is yet to come.